‘Hold your nerve’ was the message to his party from Nick Clegg yesterday. Well, this evening patients and their carers held their nerve by standing in front of conference delegates to tell their personal stories of fighting disease and the way research has helped, or could help, them. 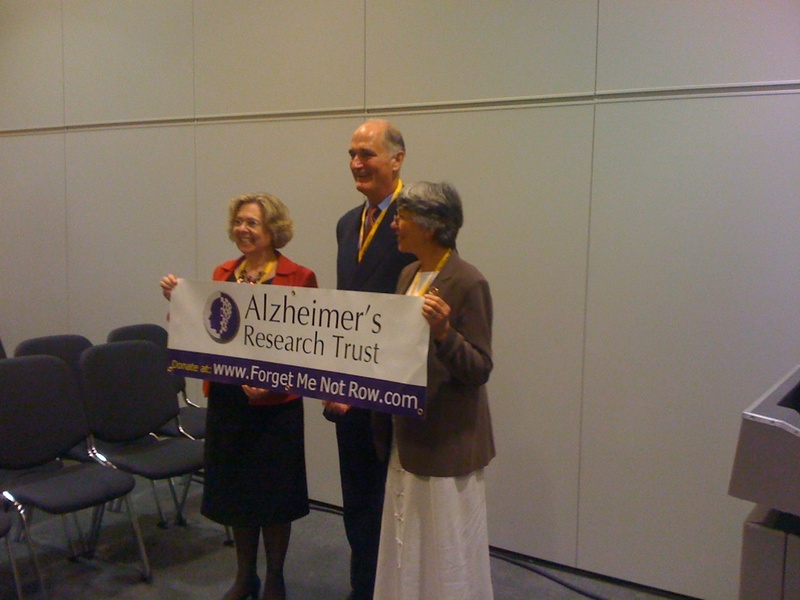 In fact if you happen to be going to any of the remaining two party conferences I fully recommend you attend the Alzheimer’s Research Trust, Anthony Nolan and Association of British Healthcare Industries (ABHI) fringe: ‘Innovation as a cure: how medical research can crack our toughest health problems.’ And not because of my eclectic style of chairing. At this evening’s event we heard from Robert France about the life-saving stem cell transplant received by his son, Jackson (aged 7) following his diagnosis with leukaemia two years before. Rob gave an engaging account of the pioneering work that has enabled his son to begin to live a normal life. He also described how the opt-in system ffor cord blood donation and the consequent lack of donors in the UK, meant that the stem cells had to be taken from an umbilical cord imported from Australia. I think we all shared his bafflement at how this was possibly good for potential patients in the UK and also about the extra costs to the NHS of having to go abroad in this way. Vicki Graham talked movingly about the impact that her husband, Jamie’s, diagnosis with Alzheimer’s had had on her and her family, and called for more research into the role that physicial activity might play in helping people to cope with her condition. They had their own personal experience to put forward of Jamie’s walking and rowing which had helped him enormously. Jamie (who joined us on the stand) and his rowing pals have raised over £80,000 for Alzheimer’s research. Dan Jones from ABHI spoke well about the regulatory hurdles placed before research and the difficulties of getting innovation taken up by the NHS as a whole rather than in pockets around the country. Baroness Northover who impressed yet again tonight I thought, urged people to get involved in the consultations on the NHS White Paper and on other aspects of emerging policy and shared her own personal story of being a carer. But it was our patients who stole the show. As they did at the MND Association, Parkinson’s UK, MS Society and Neurological Alliance fringe a little later. This one was about the alarming challenge of brain disease in the UK. Professor Colin Blakemore takes some beating in terms of getting the message across but I thought Jean, who suffers from Motor Neurone Disease, again stole the show. She reminded us of the barriers that await patients when it comes to provision of care. In fact we should all feel a sense of national shame to hear her account of the frankly bizarre decision-making in our health and social services that means she is not allowed a wheelchair to use outside because she doesn’t need to use a wheelchair all the time that she is indoors. I think it was Kafka who referred to the ‘slime of a new bureacracy.’ Jean’s story implies quick-sand left by the old and one hopes the Coalition Government can free us all from it. But, after a good week, I am determined to finish on a positive note. And that is, as I said this evening, there comes a point in much medical research where pioneering science depends on pioneering patients. No wonder they make such good advocates as well.